We were asked to visit a site in Tavistock where they were having a problem with water logging, this was caused by the heavy clay soil. Due to the consistency of the soil, it was decided the best solution to the problem would be to construct a French drain to help to disperse the water. There are 5 or 6 gardens that are suffering with the same problem; although not all to the same extent. We started on this garden on 16/04/13. The first job in the construction of the French Drain was to dig a trench about 500mm wide by 500mm deep, this trench was then lined with a fabric liner and this was then covered with 100mm of clean stone. We then laid a 100mm diameter perforated pipe, the trench was then back filled with stone. Next we set about digging out the beds , removing soil and clay to the depth of about 400mm. As you can see from the skip below there was an awful lot of clay soil to be disposed of. The picture on the right shows just one of the two 8 yard skips which were required to remove all of the waste clay soil from the garden. These beds will be re-filled with fresh blended loam topsoil, (This is very fine topsoil mixed with compost). When this is done we will lay a good quality weed suppressing membrane before replanting the beds with a mixture of perennial plants and finishing off with a top dressing of 10mm gravel. The picture on the left, shows this process in action. We have started to re-fill the bed with the fresh blended topsoil. There is to be a decked area where the French drain is. It will be approximately 7m long and 4m deep on the left-hand side and 2m deep on the right, we will therefore create a curved decking for this area. As well as the decking to be completed we still need to strip the lawn, rotovate and mix in some topsoil, we will then rake and level before laying a new lawn. We have set a time scale of 6-7 days to complete, with 4 or 5 people working on site each day. There is a lot of work involved but hopefully it will solve the drainage problems and result in a nice looking garden. Keep an eye on this blog for the next update! There is to be a decked area where the French drain is. It will be approximately 7m long and 4m deep on the left-hand side and 2m deep on the right, we will therefore create a curved decking for this area. Pictures 1 and 2 on the left show the framework for the decking under construction. In pictures 3 and 4 below the construction of the decking is complete, it took to of the team 3 days to construct.Picture 5 below shows one of the beds replanted and top dressed with 10mm pea gravel.We still need to strip the lawn, rotovate and mix in some topsoil, we will then rake and level before laying a new lawn. We had set a time scale of 6-7 days to complete, with 4 or 5 people working on site each day, we are right on track. There is a lot of work involved but hopefully it will solve the drainage problems and result in a nice looking garden. 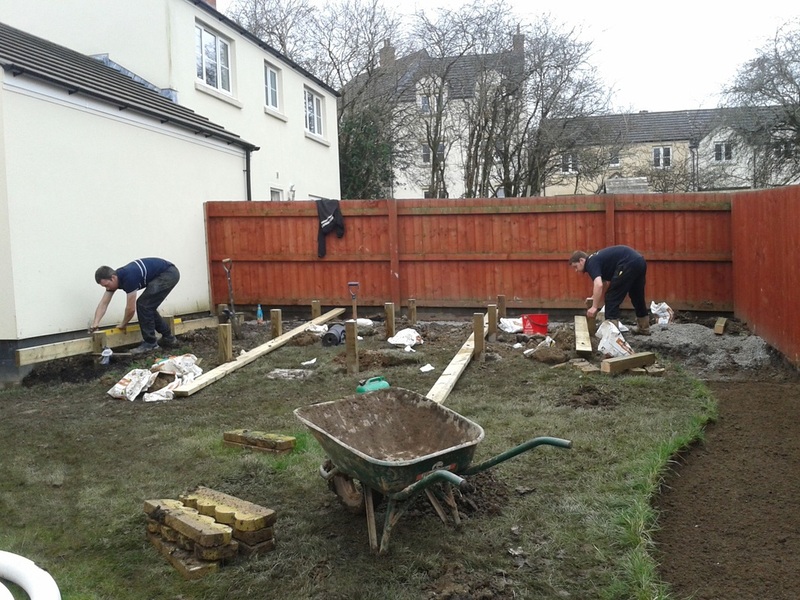 Here are some pictures of the completed garden at Tavistock. The end result is a truly amazing transformation. we are very pleased with both the appearance and the fact that the drainage problem has been resolved. Our clients are extremely happy too. We could not have asked for more...Happy clients with a fabulous garden, yet again brought in on time and within budget. The cost of such a project can differ from job to job. We have to quote each job individually as it depends on a lot of factors for example how big the garden is and how much garden needs stripping back etc. I have been struggling with this problem for a couple of years, since moving into my new house. I was advised to keep digging sharp sand into the flower beds and spiking and sprinkling sand on my lawn. This has had very little effect. I had never heard of a french drain, and although rather drastic I guess it would be worth the expense and destruction in the long run as nothing will grow in such a wet environment. How much would it cost to install a french drain?